A new study concludes that the future effects of global warming could be significantly changed over very small distances by local air movements in complex or mountainous terrain - perhaps doubling or even tripling the temperature increases in some situations. In an article to be published in the International Journal of Climatology, researchers from Oregon State University used the unique historical data provided by Oregon's H.J. Andrews Experimental Forest to study potential variations in temperature caused by steep hills and valleys. Based on a regional temperature increase of about 5 degrees projected for western Oregon by 2100, the study concluded that some locations, such as mountain ridge tops, could actually increase as much as 14 degrees at some times, while cold air pools in the valleys below them with temperature increases similar to the regional average. "Even if the predictions for average temperature changes are accurate, there's been very little work done on what that may mean in specific locations and situations," said Chris Daly, an OSU professor of geosciences, director of OSU's PRISM Climate Group and expert on the effects of elevation and topography on localized climatic effects. "We are finding that there's a potential here for tremendous disparities in local effects that we need to learn more about," Daly said. "Some locations may get much warmer than the average while others nearby are affected less, with associated impacts on their ecology, the plant and animals species that live there." 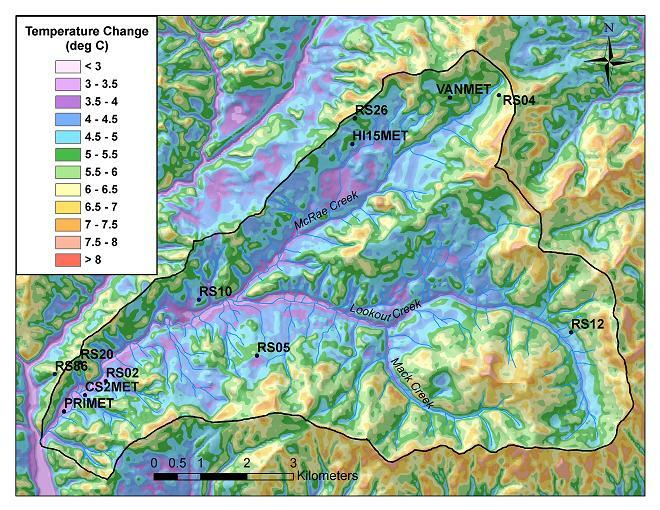 The steep terrain and long-term climate records in the H.J. Andrews Forest near Blue River, Ore., in the central Oregon Cascade Range, have provided an unusual data set to study this phenomenon. In general, temperatures decrease as you go up in altitude – but not necessarily in the mountains. Some ridges in the H.J. Andrews are routinely warmer than protected valleys below them, especially at night and during winter, as cool air drains down their flanks and forms "cold pools" with fairly stable temperatures. The formation of these cold pools is most pronounced during clear, calm weather. Since the zone of high pressure that provides California with many clear, calm days is projected to shift northward in a warming climate, the Pacific Northwest may see an increase in cold air pooling in many mountain valleys. This could lead to amplified warming on the ridges of several degrees, compared to that in the valleys. Ecological and hydrological impacts are likely, but difficult to predict. Douglas-fir forests tolerate a wide range of temperature conditions and are fairly resilient, Daly said, but some plant or animal species that can't readily move may face challenges. Cool valley bottoms with more stable temperatures could actually act as refuges from the hotter ridge tops for some species, but are not expected to escape the overall warming that will affect the region. 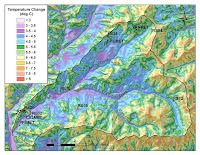 Variations in snowmelt between ridge tops and valleys are also likely to become more complex. "At a larger scale, these changes in regional airflow patterns may also alter the flow of marine air from the Pacific Ocean that helps cool and ventilate the interior valleys during summer," Daly said. "If there are more times when that ocean air flow pattern shuts down, the valleys where most of the population lives could become much hotter than expected." Similar forces could be found in many Mediterranean climates around the world, such as in Europe, South America and parts of the western U.S., which have climates that are controlled by the seasonal movement of high pressure belts, Daly said. "There is more we need to be concerned about than overall warming, and we really haven't given these localized issues much consideration," he said. Research will continue in the Andrews Forest to study these changes as they evolve, scientists said. Although not all U.S. mountains are topographically similar to this area, such steep terrain and poorly ventilated valleys are common in many parts of the Cascade Range, Sierra Nevada mountains, and Rocky Mountains.